WASHINGTON (CNN) -- The Algerian released from the Guantanamo Bay detention facility and taken to France has been hospitalized, CNN affiliate France 2 reported Saturday. Lakhdar Boumediene is at the Clamart military hospital, the station reported. Louisa Baghdadi, Boumediene's sister-in-law from Nice, told the station she and her husband "will be disappointed" if he's in poor shape. She said she "doesn't know how he has changed." Boumediene, who is not a French citizen, was sent to France because he has relatives there. He arrived Friday. "France decided to take in Lakhdar Boumediene, who expressed the willingness to come to our country where members of his family reside," the French Foreign Ministry said. Boumediene had been in custody since he and five others were arrested in Bosnia in 2001. Last year, a federal judge ordered five of the six men freed for lack of evidence supporting the accusation against them -- that they planned to bomb the U.S. Embassy in Bosnia. 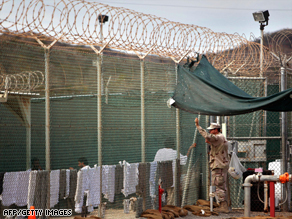 The 5-4 Supreme Court ruling bearing his name declared that detainees in the U.S. Navy prison at Guantanamo Bay have a right to appear in court and be charged. If that doesn't happen, it said, they must be released. Three of Boumediene's co-defendants were released earlier to Bosnia, where they are naturalized citizens. The fifth defendant ordered freed, Sabir Lahmar, is believed to still be in custody at Guantanamo Bay. The French statement noted that France has long called for the closing of the Guantanamo Bay facility and "hailed President Obama's decision to do so." "France reviews any individual request on a case-by-case basis in the light of its legal and security implications and the existence of a connection with our country," spokesman Eric Chevallier said. The statement noted court cases that have been decided in Boumediene's favor, including the one ordering his release. Boumediene is the second noncitizen to be accepted by a European country. Two months ago, an Ethiopian citizen, Binyam Mohamed, was accepted by the United Kingdom because he had previously lived there.